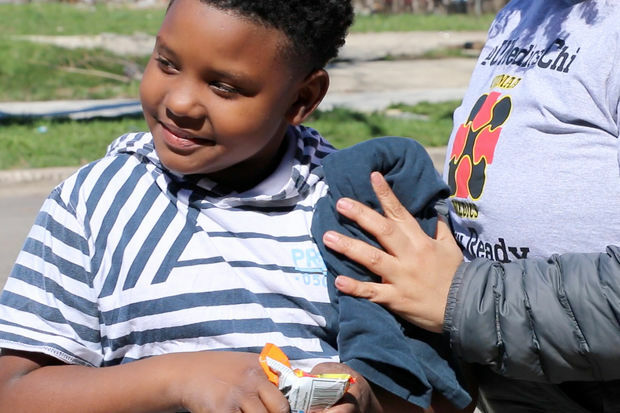 GARFIELD PARK — A group of boys laugh and munch on snacks as they talk about what they'd do in a shooting: where they would hide, how far they could run, how they'd help anyone wounded. One kid believes he's like the Flash — no bullet could move fast enough to hit him. 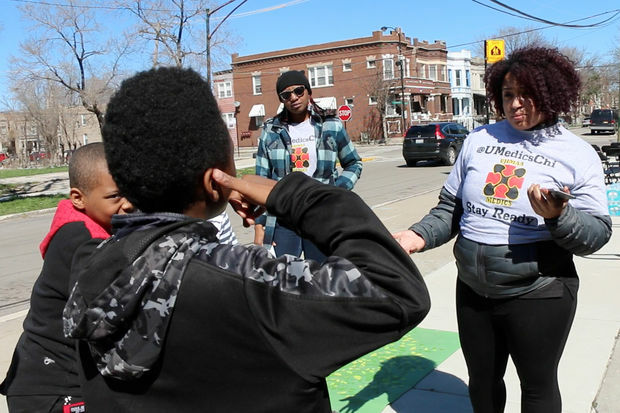 But Amika Tendaji, the founder of a group called UMedics, offers a sobering lesson to the boy — and the group: She pushes a bunched-up shirt against his shoulder, showing what she'd do if the boy had been shot. Keep the T-shirt applied to the wound, she tells the kids, and keep the pressure on. If the bullet went through his arm, then put pressure on the other side of the wound, too. And if the T-shirt soaks through with blood, get a new one. Ujimaa Medics — ujimaa or ujima is Swahili for "collective work" — started teaching Chicagoans what to do during a shooting or asthma attack in 2014. Pairs of trainers — some with professional medical experience, some without — will travel anywhere in the city, giving free workshops in living rooms, parks, churches and whatever space they can use. Speaking about asthma was important to UMedics because organizers knew many people affected by it, said co-founder Martine Caverl. Similarly, Caverl and Tendaji wanted to teach people about treating gunshot wounds because they knew it would be "important to the people that we know and love," Caverl said. More than 4,200 people were shot in Chicago last year, and at least 673 people died in shootings. Those who have received training have helped save the lives of six people so far, Tendaji said. "It's just something that everyone seems to be concerned with and everyone's affected by," said Caverl, a nurse who through her job occasionally works with people who have been shot. "You may not think about diabetes every day, but depending on where you live or where the people who you love live, you're going to be thinking about intercommunal gun violence every day." Typical sessions last 80 minutes. The 15 regular trainers make sure people with disabilities can participate, Tendaji said, and though they mostly work with teens and adults, they open the sessions to people of any age. 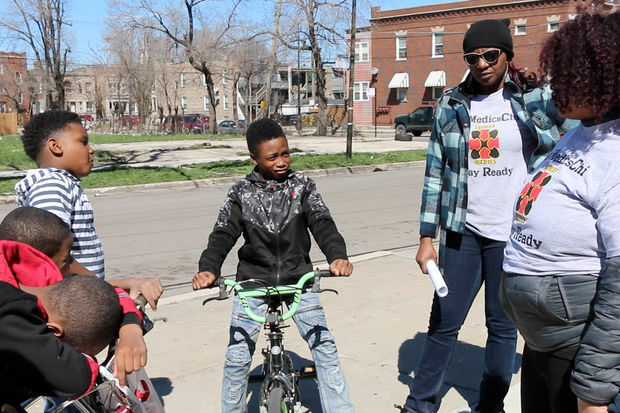 In an April workshop in Garfield Park, Tendaji's audience was a group of young boys who drank juice and balanced on bikes while listening to her speak. One boy said he'd play dead and lay on the ground if he heard gunfire. Tendaji kept her lesson shorter to suit their attention span. She joked with them and asked them questions, seeing if they'd understood her lessons. "Young boys from that neighborhood aren't really able to be very vulnerable and display a lot of emotion, and so a lot of times laughter and joking is cover for that, is cover for dealing with any kind of difficult conversation," Tendaji said. "I went through [afterward], asking them to repeat some things back, and they pretty much had it." UMedics cofounder Martine Caverl talks about how she used her skills to help a man who had been shot. During that session, Tendaji talked to her audience about what to do during a shooting, what to say when calling 911 and how to work with officials like police and paramedics. But UMedics also wants people to be able to give potentially life-saving care, so Tendaji and UMedics trainer Day Davis showed the boys how to apply pressure to a wound, told them not to remove a knife if someone is stabbed and taught them how to raise the arms of people with asthma when they're having trouble breathing. Afterward, Tendaji showed the audience the first aid kit she brings with her everywhere and encouraged them to carry one. Hers contains bandages, a tourniquet, antiseptic spray, pads, medicines and other items. Directly working with community members like those boys is a key part of UMedics' mission. They want residents to feel they have autonomy over their bodies and their healthcare, Tendaji said, and the workshops show them they can have an impact even in emergency situations. "The people from the community are spreading the word, are trying to help their own community," said Davis, who graduated from medical school last year. "So it's not necessarily outsiders coming in and trying to tell us what to do and how to do it but people that are actually affected by the issues of the community addressing said issues. "You need people that actually live, breathe and work in those communities to address those issues." Working within communities also gives UMedics organizers a chance to speak to residents about their experiences and learn what's important to them, organizers said. Trainers use humor to connect with participants, Caverl said, and they're careful not to re-traumatize those who come. "It's important for people to see themselves as empowered, to see themselves as people who can be resources to others in their community, to see themselves as healers," Caverl said. Though the first UMedics workshop was held in 2014, organizers have been thinking about it since 2010, when community organizer Damian Turner was killed. Turner, 18, was shot near the University of Chicago Medical Center in 2010, but an ambulance took him to Northwestern Hospital — he was too old to go to U. of C.'s trauma center, which only treated patients that were minors. Turner died along the way. "Damian was one of those people on the South Side who just don't have access to the healthcare they need," Caverl said. "People didn't want to just mourn his death — they wanted to make sure it wouldn't happen to more people, make sure there were resources for people on the South Side." Tendaji and Caverl came up with an idea: They wanted a group that would teach Chicagoans what to do in an emergency like a shooting. Unsure if they were the right people to launch it, Tendaji and Caverl shopped the idea around to community groups. The groups thought the idea was a good one, Tendaji said, but no one took on the project. By 2014, Tendaji and Caverl decided they had to launch the program themselves. They didn't have a name for their workshops, and the initial response was "really slow," Caverl said. It was a year and a half before word got out about UMedics. They got more requests for sessions, and they taught more people — some as young as 9 and 12 years old — how to be trainers at the workshops. Last year, UMedics trained 250 people in 14 workshops. Caverl estimates the group has trained more than 300 people since starting. Even Caverl said she benefited from what she learned in establishing the group. In December, as she left a funeral, she heard gunshots. A boy outside had been shot and she used her head scarf to apply pressure to his wound while keeping him alert. Paramedics arrived, and the young man was able to walk to the ambulance. "Having Umedics training helped me to know how to be responsive in that situation," she said in a YouTube video. UMedics has run on donations in the past, though it's now experimenting with having those who request workshops pay on a sliding scale, Caverl said. The group is looking for a non-profit organization that can accept donations for UMedics so the donations can be tax deductible. Tendaji said the group is training more people and is looking at how it can grow or what else it can teach residents. She'd like UMedics trainers to be able to help women through pregnancy and childbirth. "In other aspects of my work as an organizer, I end up dealing with a lot of death," Tendaji said. "So bringing in life with UMedics would be lovely." Caverl said the group wants to develop the skills of its trainers and help them become leaders in their communities. UMedics aims to play a role in conversations about Chicago and improving public health for the people living in the city. The group also wants to host more workshops in more spots around the city — UMedics sessions can be requested online — and teach more people to become trainers in the group. "Ideally, we want this training to not be necessary, right?" Davis said. "But in the meantime, we just want as many people to be as prepared as humanly possible."